Here's my third project for the Pootler's Design Team, using the Quirky Critters Stamp Set. This one's perfect for me as I am rubbish at remembering to send cards...I never forget the birthday, I just forget to post the card!!!! 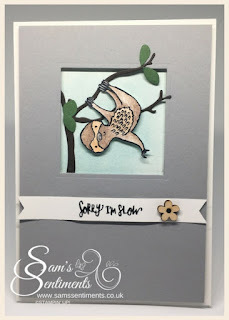 For this card I used a Whisper White card base and a dimensional Smoky Slate layer with a window cut out using the Layering Squares Framelits. 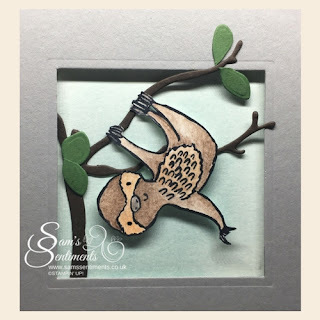 I coloured the Sloth using the fabulous Watercolour Pencils & Blending Pens and sponged the sky using Soft Sky Ink. I created the tree using the branch & leaf dies from the Seasonal Layers Thinlits with Garden Green and Early Espresso cardstock. The little wooden flower comes from the Touches of Nature Elements. Here's a list of the products I used, if you'd like to purchase any of them all you have to do is click on the picture and you'll be taken over to my store.